"This is my first time, and I'll be back every time from this point forward,” one officer said. 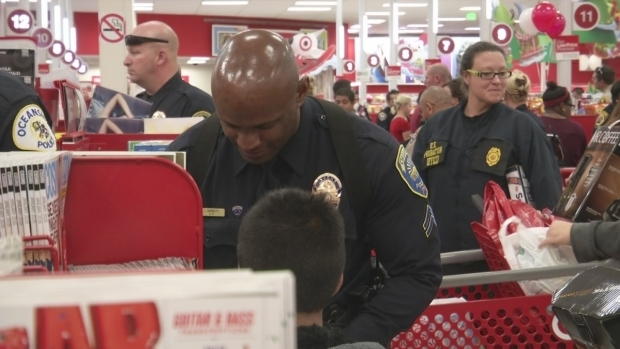 More than 300 San Diego uniformed officers spent their Saturday partnered with local deserving kids on a holiday shopping spree at Target. The 22nd Annual “Shop with a Cop” event started with a breakfast and private animal show at SeaWorld before heading off to a local Target. There, kids got to spend $150 on gifts. One San Diego Police officer said it was his first time doing the event and called it outstanding. "This is my first time, and I'll be back every time from this point forward,” he said. “This is how amazing it is." Many of the kids at the event said they were shopping for their family members -- mothers, fathers, siblings and cousins. "Many of them are so selfless and are looking to shop for their siblings, their parents, their law enforcement officer, and thinking about themselves last," said Claire O’Leary with STAR/PAL. The officers involved come from more than 30 different local, state and federal agencies to participate in the event. The event this year was hosted by the San Diego Police Department. "And it's really just a beautiful experience of happiness and holiday cheer and we're glad we get to provide that for these kids," O'Leary said. The annual event is sponsored by local law enforcement agencies and SeaWorld, Target, STAR/PAL and the San Diego Crime Commission.